YAOUNDE, Cameroon (AP) — John Nlom has five children and wants to keep them alive. When machete-wielding men attacked a nearby school this month in a suspected strike against the teaching of French, wounded students were rushed to hospitals while frightened parents decided to flee. Nlom and his family piled onto one of the dozens of buses now leaving daily from the capital of Cameroon’s Southwest Region, joining thousands of civilians escaping bloody fighting between the government and Anglophone separatists who vow to disrupt next month’s presidential elections. The government of the largely French-speaking country insists the Oct. 7 vote will be peaceful, even in the troubled English-speaking southwest and northwest where nearly 400 people have died. Nlom, a teacher, could not take that chance. “The governor himself who is saying that people should stay back, that they are protected, he is moving around with soldiers protecting him,” Nlom said. “Will the soldiers protect all the people? That is the reason why I cannot stay.” He and his family, like many, have taken refuge in the French-speaking city of Douala. President Paul Biya, one of Africa’s longest-serving leaders since taking power since 1982, vows to hold the country together. 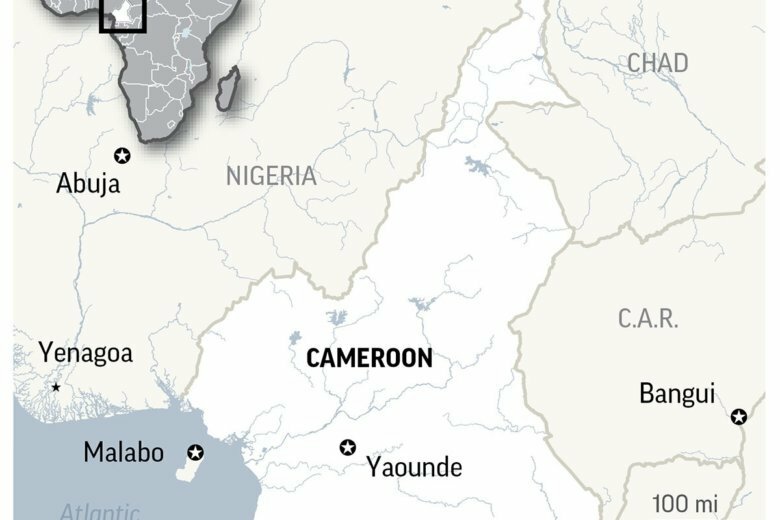 The separatists, with support from some in the diaspora in the United States and elsewhere, are fighting to create an independent state they call “Ambazonia” in Cameroon’s English-speaking northwest and southwest regions. Their movement grew out of dissatisfaction with what some English speakers, who make up about 20 percent of the country’s population, have called marginalization in the officially bilingual country. The blocking of the internet in English-speaking regions for months last year fed the frustrations. The government describes the fighters as terrorists. Weary civilians caught in the fighting have pleaded for peace. Women, saying they can no longer remain silent, have gathered for protests, saying the violence keeps children from their studies. At least 70 schools have been burned. Last week, Muslim and Christian clerics announced they are afraid a wave of carnage could occur if peace is not found before the election. “We call on the diaspora to stop the hate speech communication that promotes violence, suspicion and fear among the people of Cameroon,” their declaration said. The clerics asked both the military and armed groups to drop their guns and stop the killing, looting and burning that have sent nearly 200,000 civilians fleeing. The government, however, replied that only the separatists should drop their guns. Attacks were reported in at least 20 towns and villages over the weekend, according to the country’s minister of territorial administration, Paul Atanga Nji. Casualty figures were not yet available, he said. Human rights groups have accused both sides of abuses. Separatists have burned and crushed buses and used construction equipment to dig up roads in efforts to stop people from fleeing. Some people leaving English-speaking regions have said the military conducts searches on those trying to leave. With the elections approaching, the tensions have grown. Separatists on Friday blew up a key bridge to stop campaign teams from reaching communities, authorities said. “The only bridge linking the northwest regional capital, Bamenda, with other localities like Bui and Donga was destroyed by the terrorists,” said Lele L’Afrique Deben Tchoffo, governor of the Northwest Region. Thousands of passengers were stranded, he said. In response, the military killed at least a dozen separatists near the northwestern town of Mbiame as they planted explosives to blow up another bridge, the governor said. People who have fled the English-speaking regions will not be able to vote if they don’t return to the polling centers where they are registered, he warned. In Cameroon’s French-speaking areas, campaign rallies kicked off over the weekend in defiance of the separatist threat. “We should not fear them. We should brave the situation and go about campaigning. The government has deployed troops to protect everyone,” Prime Minister Philemon Yang told supporters in Bamenda while campaigning for the longtime president. Biya is favored to win another seven-year term, as opposition parties did not succeed in negotiations to back a single candidate. Cameroon’s government has vowed that voting will take place nationwide. “We have … created polling centers where voters can assemble and vote under the protection of the military,” said the chairman of the country’s electoral board, Enow Abrams Egbe.